Despite his ongoing trial by the Economic and Financial Crimes Commission, the founder of DAAR Communication, Chief Raymond Dopkesi, on Tuesday sent season’s greeting cards to President Muhammadu Buhari and Vice President Yemi Osinbajo. The giant cards bearing goodwill messages on Eid el Maulud, Christmas and New Year was taken to the Presidential Villa, Abuja, by a team led by the communication outfit’s Chairman, Mr. Raymond Dokpesi Jnr. Others on the delegation were the Managing Director, Mr. Tony Akiotu; Managing Director, DAAR News Services, Imoni Amarere; Head, Human Resource, Paulyn Ugbodaga; and Head, Corporate Communications, Kunle Onime. They were received on behalf of the President by his Special Adviser on Media and Publicity, Mr. Femi Adesina, who was joined by a Director of Information, Mr. Justin Abuah. The delegation later moved to the Vice President’s office where they were received by his Senior Special Assistant Documentation, Mr. Sesan Adeboyejo. 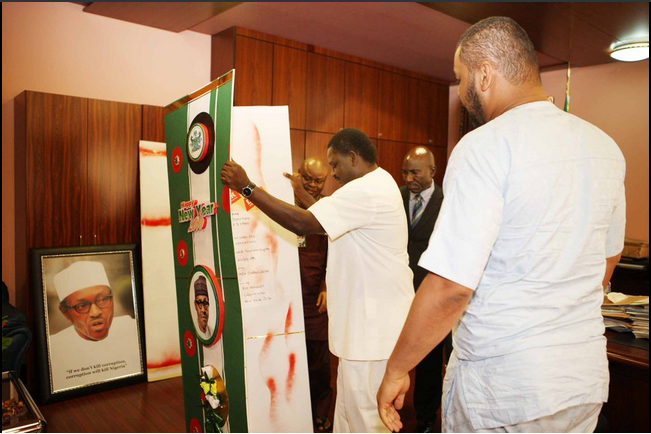 Adeboyejo, like Adesina, also received the giant card on behalf of his boss and posed for photographs with members of the delegation. Dokpesi is currently facing a six-count of alleged money laundering. He was charged by the EFCC. He is currently on bail in the sum of N200m, with two sureties in like sum. The trial judge also directed Dokpesi to surrender his international passport, which will only be released to him after application to the court should he be required to travel outside the country.